Photograph depicts unknown men entering back of bus, second bus on left. Old Mine Dry Change House in right background; power lines, vehicles, and trees in left background. These buses transported workers from the plant to the mine. 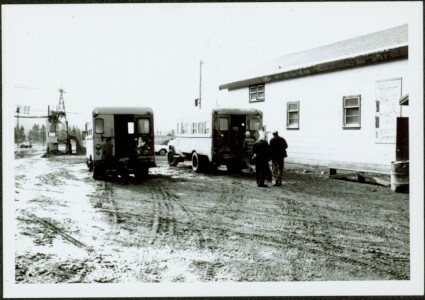 Small pickup trucks called "crummies" with cabin mounted in box were used when traveling on the steeper road to the South Peak. Photo commentary and background narrations available from individuals who contributed to Northern BC Archives Facebook Photo ID Project, contact archivist for access to comments in research file pertaining to this photograph. Item is part of the Cassiar Asbestos Corporation Ltd. fonds. Image is one of 45, see items 2000.1.1.3.19.33 - 2000.1.1.3.19.77.